British Prime Minister Theresa May’s Brexit plans may be in tatters, but Singapore-based Concorde Security is moving ahead with its expansion plans in the United Kingdom. The upcoming Singapore Food Agency (SFA) will work to oversee food safety and security. The momentum of Malaysia’s relationship with Singapore is very positive, said Malaysian Minister for Economic Affairs Mohamed Azmin Ali on Wednesday (Jan 16), after meeting Singapore ministers to discuss bilateral issues over the weekend. Barely a year after A-level scripts were stolen in Britain, O-level scripts have gone missing (32 O-level Additional Maths scripts lost in Britain; Jan 15). The share of workers here whose companies provide formal flexible work arrangements continues to grow, and employers are offering more types of such perks. SINGAPORE’s top 100 listed companies appear to be steadily weaning themselves from the ‘all-boys club’ in the boardrooms. In 2013, half of them had zero women while as at end-2018, just-men boards shrank to 25 per cent. A rare plot of land that’s zoned for a hotel near Singapore’s central business district has attracted a record bid as developers shift focus after last year’s property cooling measures. The Ministry of Culture, Community and Youth (MCCY) has admitted that the Founders’ Memorial it is building will commemorate founding Prime Minister Lee Kuan Yew and his values and ideals. Plans to commemorate the late elder statesman through a memorial are moving forward in spite of his aversion to monuments. BUDGET 2019 should help Singapore realise its Smart Nation vision, said KPMG on Wednesday, recommending moves in financial services, real estate, healthcare and life sciences, consumer retail and technology, as well as cybersecurity. As any first year Philosophy undergraduate can tell you, discussion and debate have been the beating heart of university life ever since Plato’s Academy. Minister of State for Manpower, Zaqy Mohamad, revealed in Parliament yesterday that a total of 521 errant companies that engaged in unfair employment practices were warned or sanctioned by the Ministry of Manpower (MOM) between 2013 and 2017. Two Singaporeans – a former religious teacher and one of his students – have been issued restriction orders under the Internal Security Act (ISA), the Ministry of Home Affairs (MHA) announced on Wednesday (Jan 16). Singapore, Russia and their partners in the Eurasian Economic Union (EAEU) are making good progress on concluding the EAEU-Singapore Free Trade Agreement (FTA) by the middle of the year, Deputy Prime Minister Tharman Shanmugaratnam said on Tuesday. Home Affairs and Law Minister K Shanmugam said that the Islamic Religious Council of Singapore (Muis) should be commended for revoking a religious teacher’s accreditation after it learnt about his misguided teachings. Eight unauthorised drones were reported flying within 5km of Changi Airport in the past three years. What measures are in place to counter these errant drones? A state-of-the-art national centre for managing infectious diseases is set to be fully operational by May. Hardened drug addicts will soon undergo longer and more intensive rehabilitation programmes at the Drug Rehabilitation Centre (DRC), following amendments to the law that open the way for them to undergo repeated rehabilitation rather than serve prison time. Sino Grandness Food Industry Group, the producer and distributor of branded juices and canned fruits and vegetables, has revealed that it was served with a letter of demand on Jan 8 totalling $28.73 million. Affecting more than 420 million people globally, diabetes has been described as one of the world’s fastest growing chronic diseases and for Alan Phua, it is one that he lost both his grandmothers to. INVESTMENTS to drive fintech adoption, tax policies to increase cyber resilience and the adoption of new technologies, and enhance R&D (research and development) are among KPMG’s suggestions for Singapore Budget 2019. The Info-communications Media Development Authority (IMDA) is looking into blocking automated scam calls and text messages promoting illegal activities. LURED by the promise of a large user base and a well of data to tap, insurance companies are tying up with non-insurtech digital platforms to open up a new distribution channel for their products. Ride-hailing platform Grab yesterday launched a free medical leave insurance scheme for drivers – but they must hit a minimum level of earnings. Singaporean-organised “shopping tours” into Johor ahead of the Chinese New Year are seeing last-minute cancellations as relations between the two countries tense up over a maritime and airspace dispute, reported Sin Chew daily. After sending rival Uber Technologies Inc packing from Singapore and other Southeast Asian markets, homegrown ride-hailing firm Grab has set itself a stiffer target. It wants to be a regional super-app. The Diversity Action Committee (DAC) will widen its scope from January, from increasing representation of women on boards of Singapore Exchange (SGX)-listed companies to include organisations in the people and public sectors. 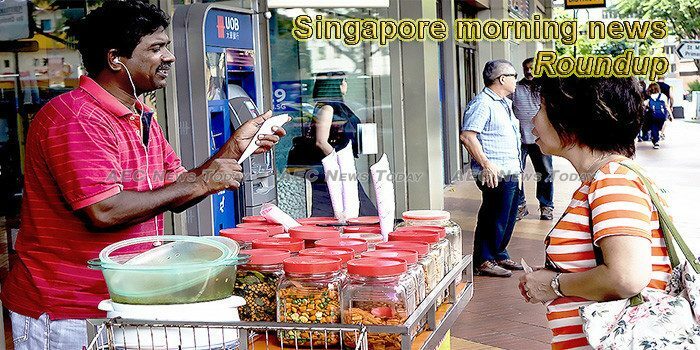 Hordes of office workers stream out of air-conditioned glass buildings in the heart of Singapore’s Central Business District toward Amoy Street Hawker Centre. The National Transport Workers’ Union (NTWU) on Wednesday (Jan 16) announced its recommendations to the Land Transport Master Plan 2040, providing its input on the shape of the future of Singapore’s land transport system. The amended Misuse of Drugs Act that Parliament passed on Tuesday has been applauded by rehabilitation experts for its shift towards rehabilitation of drug addicts, though some wondered if there were loopholes that could increase the chances of a relapse. A Singaporean businessman has told a court here that he was told to lie, to hide a money trail linked to one of the biggest athletics doping cover-up involving one of Russia’s biggest stars. There were 76 cases of piracy and armed robbery incidents on the seas around the region last year, down from 101 in 2017 and the lowest number since the Singapore-based Regional Cooperation Agreement on Combating Piracy and Armed Robbery against Ships in Asia (ReCAAP) began tracking such figures in 2007. Viewers enjoying a light show projected on the facade of the National Gallery Singapore at a media preview last night of the Light to Night Festival, which returns for a bumper edition until Feb 24. A traditional Chinese medicine (TCM) physician has been suspended from practice for three years for abetting the operation of an illegal massage parlour in MacPherson called Gold Finger Wellness & Health Centre. Sein Mok Sin, 68, was suspended by the TCM Practitioners Board last month, it said in a statement on Monday. Please form an orderly queue, guys. The Consumer Association of Singapore (CASE) on Wednesday (Jan 16) issued a consumer advisory reminding shoppers to read the fine print when making purchases online, after complaints about e-commerce retailer Fashion Interactive. On January 15, Tuesday, at the launch of a new program that would recognize what people with special needs have accomplished, Emeritus Senior Minister Goh Chok Tong suggested that the Government can offer more tax incentives in order to encourage employers to hire those with disabilities. ESM Goh said that those who employed workers with disabilities. Potong Pasir residents who have had their sleep disrupted by the cacophony of mynahs squawking can rest more soundly now.